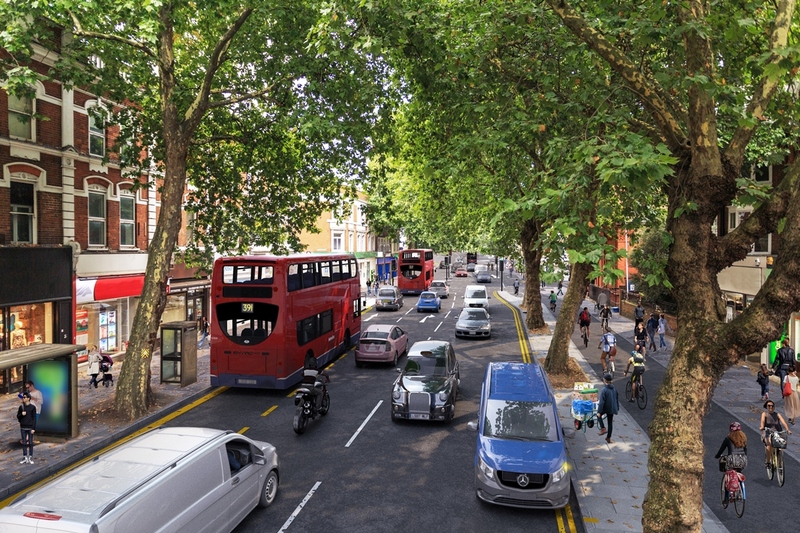 TfL has recently unveiled its plans and launched a consultation for a Cycle Superhighway that runs through Chiswick High Road. Chiswick High Road Action Group believes that CS9 does not go far enough in implementing the Mayor for London’s strategic goals set out in his 2017 Draft Transport Strategy, which emphasises reducing London’s dependency on cars and promoting cycling and walking. TfL state that there are “difficult choices to be made in determining the layout for roads on the alignment”. CHRAG understands this, but a balance between encouraging cycling and walking along Chiswick High Road has not been achieved. CHRAG believes that TfL have swung too far in favour of motor vehicles at the expense of pedestrian walkways which, under these plans, would see an unnecessary reduction in space that will make walking to the shops and spending time outdoors a less attractive premise for local residents and visitors. Plans for the Cycle Superhighway are long overdue and CHRAG strongly support a segregated cycle superhighway along the South side of Chiswick High Road, however the plans in their current form do not provide the best long term solution for the High Road. Whilst CHRAG appreciates that reducing space for cars can cause additional short term congestion, the group feels that this once-in-a-lifetime opportunity must not be missed to look much further into the future and take a more ambitious interpretation of the Mayor’s Transport Strategy. In order to facilitate CS9, some trees would be removed and kerb-lines moved to make pavements more narrow. Even in certain locations where bus lanes are removed, significant loss of pavement is still proposed, rather than loss of motor vehicle space. CHRAG understands that in some cases where there are “pinch points” along the High Road, TfL may consider it favourable to take measures to ease congestion. And despite many of CHRAG’s members being motor vehicle users, overall the group believes there are far more creative ways to achieve the Mayor’s goals and the group is seeking to influence decisions made in the coming months to this end. As for the reduction of cars on the road and long term changes that will reduce pollution, CHRAG believes these changes are a matter of when, not if. CHRAG is therefore unhappy with CS9’s proposals to take so much from pedestrian space even if it is given to cycles. Given the rarity of such change events to kerb lines and road layouts, CHRAG strongly believes that TfL must now reconsider the priorities of CS9 to prepare the way for changes over the coming decades in reducing motor vehicles on the road. Such a change of focus at this stage by TfL would result in a move towards cleaner air around Chiswick High Road, as well as protecting the High Road’s precious culture of cafes, restaurants, and meeting spaces. It would set the High Road up for the future, and it would go further towards the goals set out in the Mayor’s Transport Strategy.